I make cookies throughout the year, but not many iced sugar cookies. 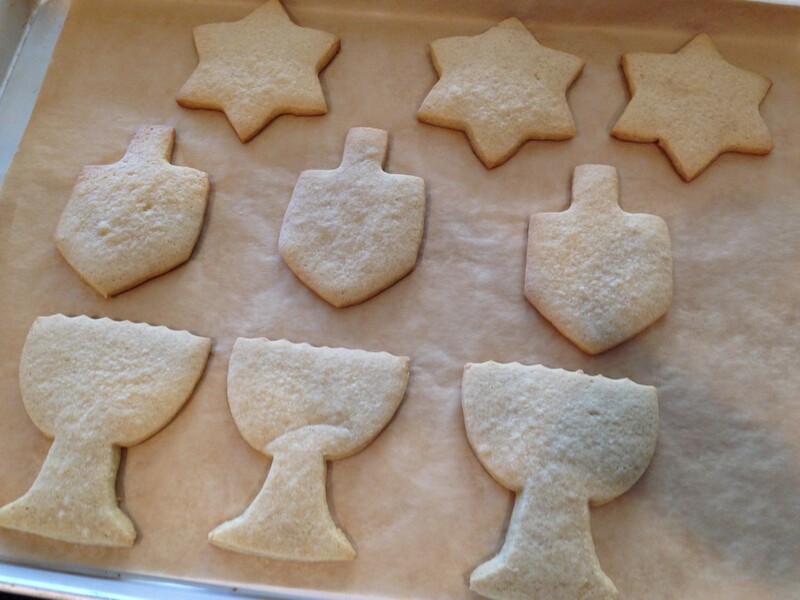 I save “dressed up” cookies for Chanukah. It takes time yes (and patience for sure), but they are certainly worth it. Safe for my children to eat, without any strange ingredients, and so much fun to eat! Although traditional decorating colors of Chanukah are blue and white, I have yet to find a dye-free natural blue food coloring, nor have I come up with a pretty blue natural food coloring so I went with a “white festival of lights” kind of theme. 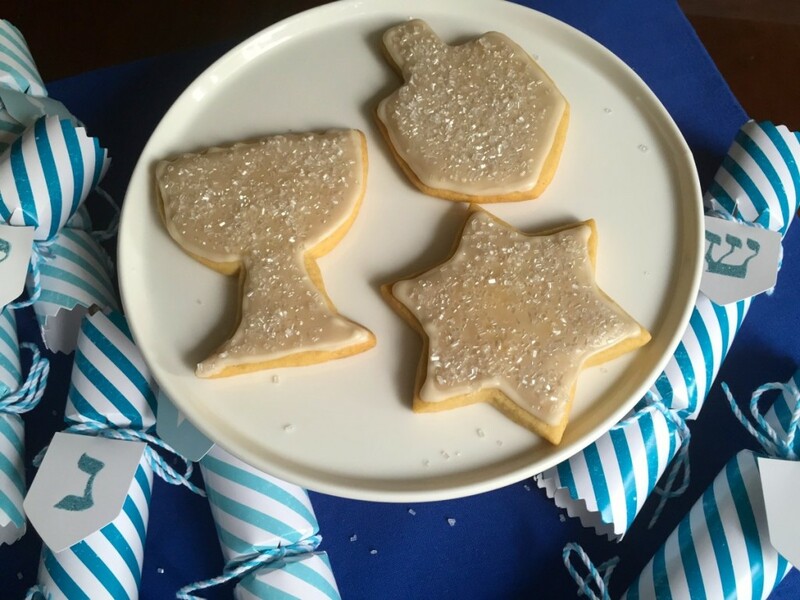 This sugar cookie recipe is versatile enough to create any cookie shapes really. It’s a fun cookie to make, especially with kids who love to bake and decorate. And the icing can be flavored to your taste. These cookies also freeze exceptionally well, with or without the icing – perfect for making ahead. Wishing those who celebrate a Happy and Healthy Chanukah! 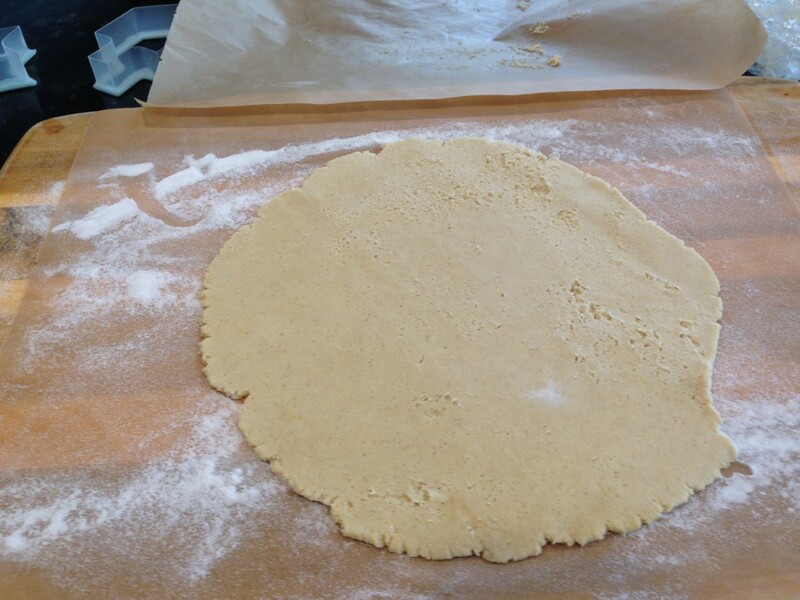 To make it easier: roll out the dough on floured parchment paper then transfer it (with the paper) onto my baking sheet and cut directly on the pan to avoid the ‘lift and transfer cut cookies’ step. The less handling, the better, in order to hold their shape. If the cookie cutters are beginning to pull the dough, put the baking sheet back in the freezer for 5 minutes to firm up the dough, or refrigerate for 10-15 minutes. Excuse my fingers in there, wanted to show you how you can lift up the paper if you have trouble releasing the dough from the cookie cutter. 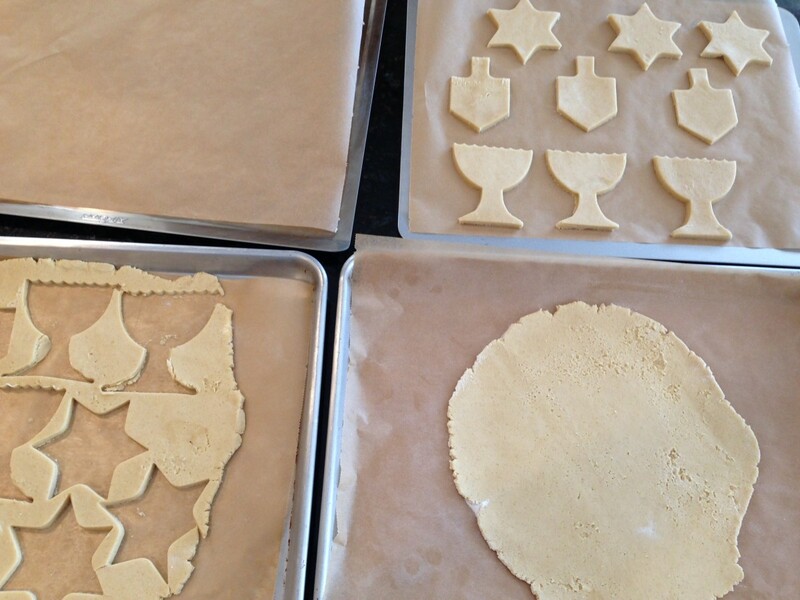 Transfer scraps onto a new parchment paper and repeat cut shapes. When they are all ready, bake simultaneously (if you have a large oven) or keep two sheet pans in the refrigerator while two pans bake. These cookies are very forgiving of all the chilling during preparation. Cookies should be cooled completely. I baked mine two days prior and freeze them, then put them out on cooling racks with parchment paper underneath to catch spills (I know LOTS of parchment paper when baking/icing!) and let them come to room temperature while I prepare my icing and put into squeeze bottles. Iced cookies need 24 hours to completely harden, so clear a good amount of space where they can set undisturbed on parchment paper. You don’t want any distance between your icing and cookie in order to maintain one consistent trace of the cookie. Thicker lines are better than thin lines for separating the areas for flood icing. When border icing has hardened begin filling the interior area of the cookie by squeezing out a little at a time so as not to pool too much icing onto the cookie. 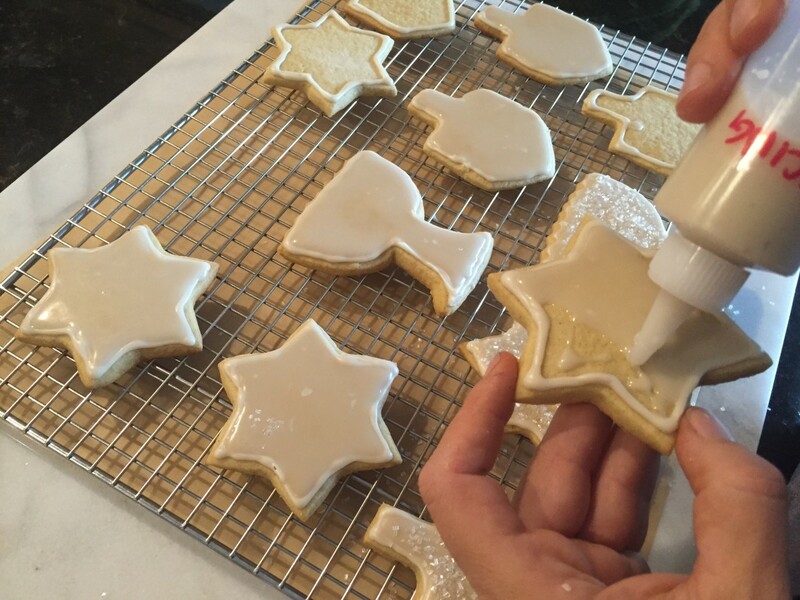 Then squeeze out as needed until the cookie interior has been covered with icing. Push the icing into the corners and along the edges by gently using the tip of the squeeze bottle. Once all cookies have been iced sprinkle coarse sparkling sugar. I looked for this brand online for those who need dye free, but couldn’t find it anywhere, maybe you will have better luck than I did. If not, I believe King Arthur Flour has dye-free sparkle sugar on their website. 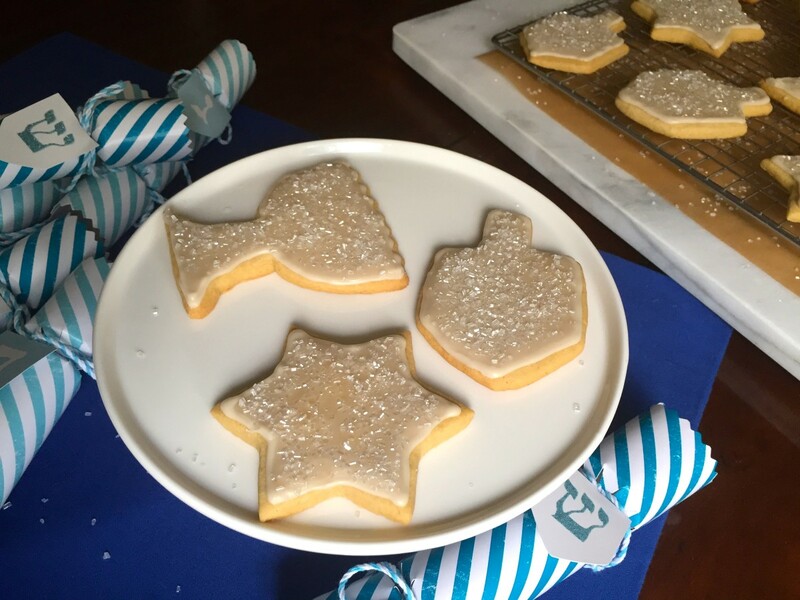 Chanukah Sugar Cookies just like the ones you remember, without gluten, dairy, egg, and soy. Allergen-free cookies everyone can enjoy, in any shape desired! 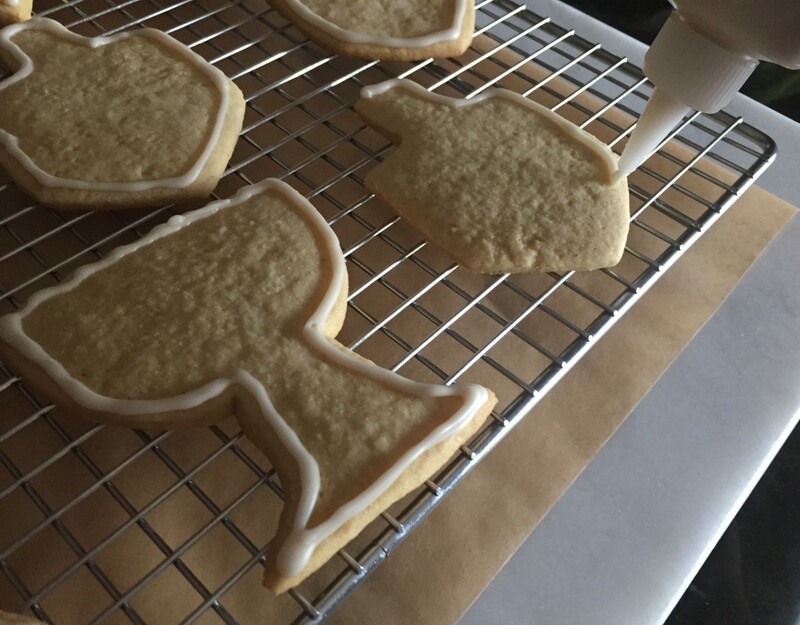 You will need large (3-inch) cookie cutters. Combine ground flax seed meal and warm water, stir to combine. Set aside. Whisk together flour, baking soda, kosher salt, in a medium bowl. Set aside. Beat non-dairy butter, and sugar in a stand mixer set with a paddle attachment on medium speed for a minute until well blended. Do not overmix otherwise the cookies will come out puffy. Add flax seed mixture and vanilla then beat until just combined. Reduce mixer to low; add flour mixture and beat until just combined. 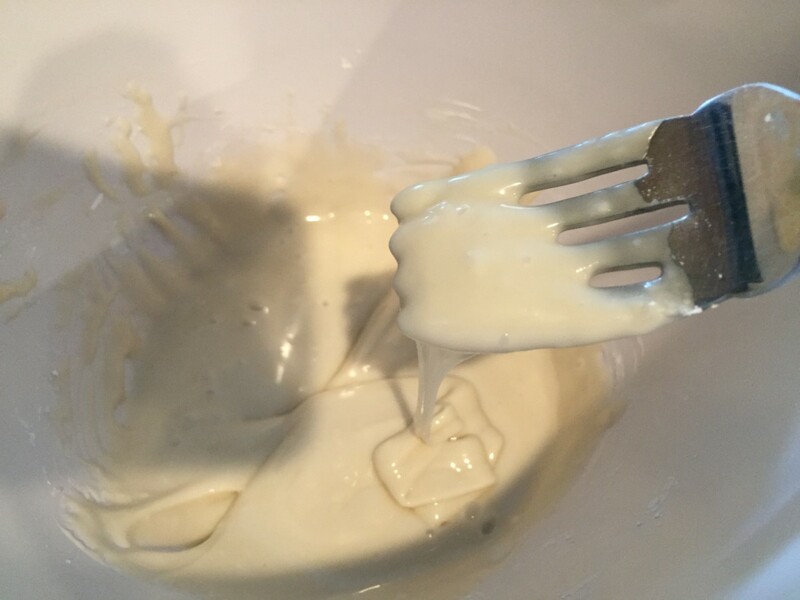 Using a rubber spatula, scrape any unmixed batter at the bottom of the bowl. Transfer dough onto a lightly floured parchment paper set on a cutting board or other sturdy surface that can be lifted later. 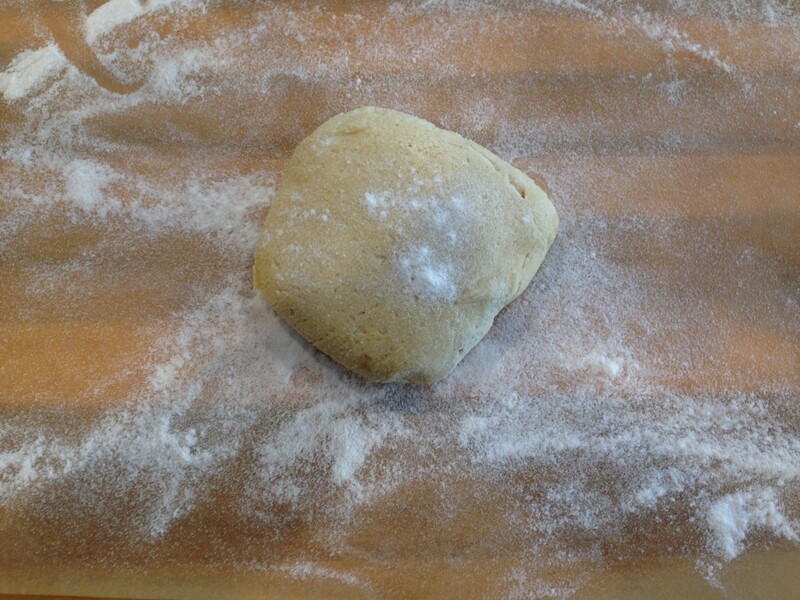 Cover with another piece of parchment paper and roll out dough to a ¼ inch thickness. Chill the rolled out dough for 30 minutes. Prepare 3 baking sheets lined with parchment paper (no greasing needed). 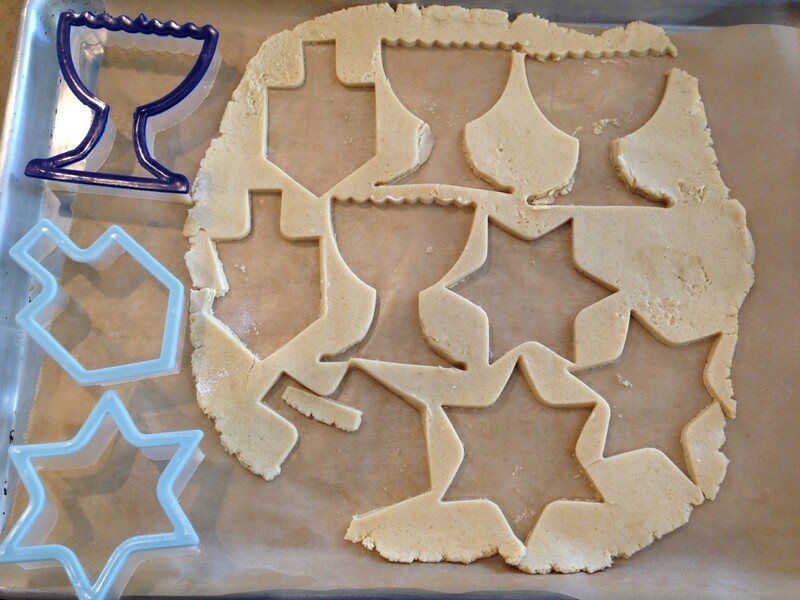 Cut out shapes, place onto the baking sheets. 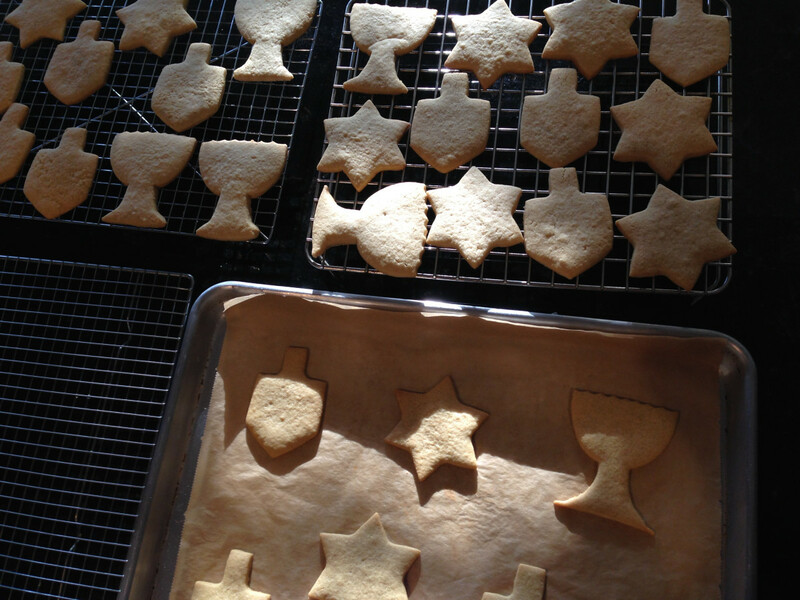 Space about 1½ inches apart, approximately 12 cookies to a baking sheet. 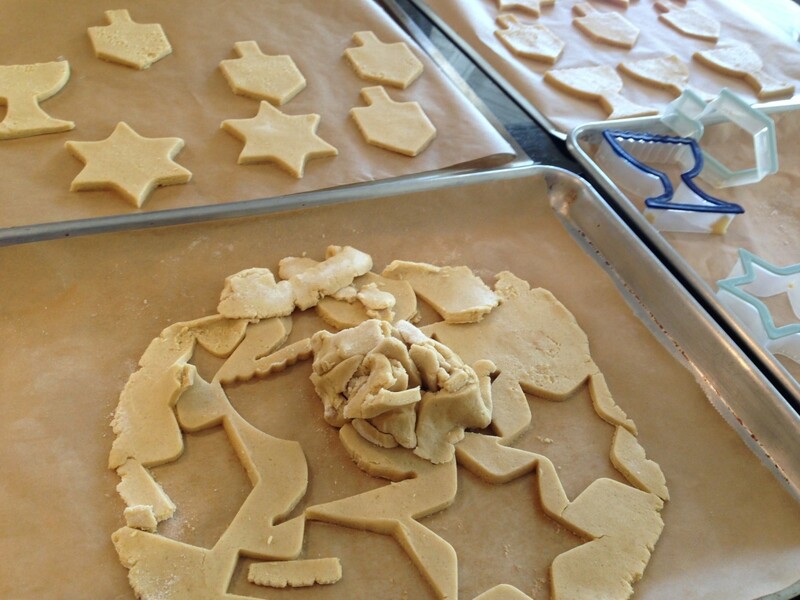 Repeat with remaining dough scraps to cut out more shapes until all the dough has been used. Chill the cut cookies for 45-60 minutes. Bake the cookies for 10-12 minutes, until edges look golden and bottoms are browned. Let cool on the baking sheets for at least 15 minutes. Transfer to cooling racks to cool completely. Cookies should be cooled completely. I baked mine two days prior and froze them, then put them out on cooling racks with parchment paper underneath (I know LOTS of parchment paper when baking/icing!) to let them come to room temperature while I prepared my icing and put them into squeeze bottles. Iced cookies need 24 hours to completely harden, so clear a good amount of space where they can set undisturbed on parchment paper. If you are enjoying these the same day, let them set for 4 hours before serving. I have put cookies up on top shelves in my pantry or in cabinets to keep them out of my kid’s hands! Since I used white icing for these cookies I labeled my squeeze bottles to avoid any confusion. Mix together the powdered sugar, coconut milk, and lemon extract using a fork. It will be very thick and will form ribbons when poured off the fork. The ribbons should hold before combining into the icing quickly. Add food coloring, if desired. 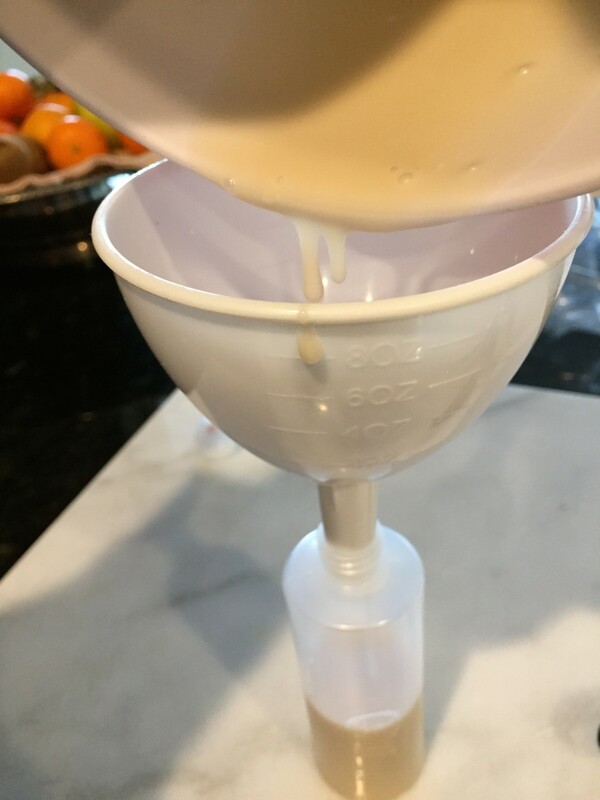 Twist off the cover of a clean squeeze bottle and insert the funnel into the opening, pour some of the thick icing into the funnel. This icing is very thick and will not budge on its own. Push a butter knife into the thick icing by pressing into the opening of the funnel repeatedly, this should help get the icing moving. You can also squeeze the bottle to suction the icing for it to start flowing. Border icing takes about 20 minutes to pour into the bottle, so I suggest leaning the bottle (with the funnel attached) against something stable to prop it up while it pours. Occasionally, push into the funnel with the butter knife if it slows down. Add remaining icing into the funnel. Hold the bottle vertical squeezing with a consistent pressure and the tip of the bottle slightly above the cookie. 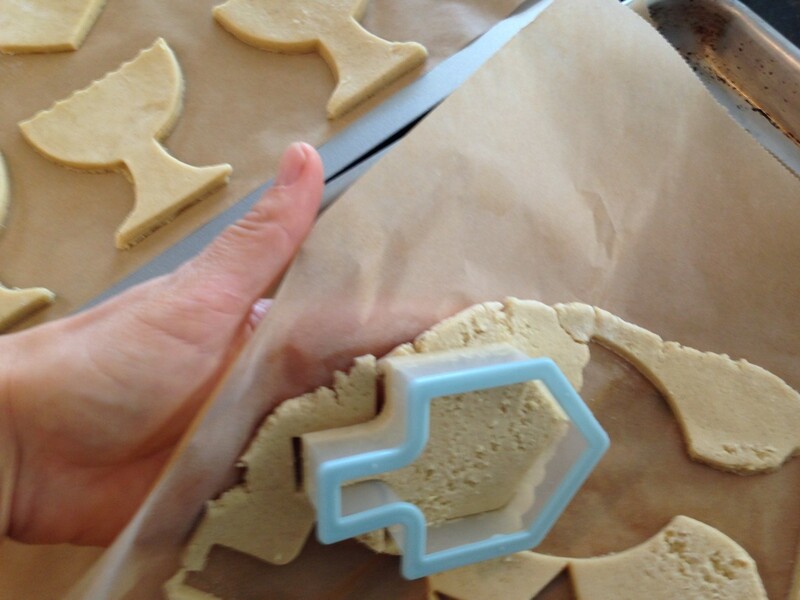 Begin icing along the edge of the cookie, as if tracing an outline of the cookie. Note: You don’t want any distance between your icing and cookie in order to maintain one consistent trace of the cookie. Thicker lines are better than thin lines for separating the areas for flood icing. Let the border icing harden (to the touch) before flooding. Meanwhile, prepare your flood icing while you wait. Mix together the sugar, coconut milk, and extract using a fork until completely smooth. It should be fairly thick, but drizzle off the fork easily. 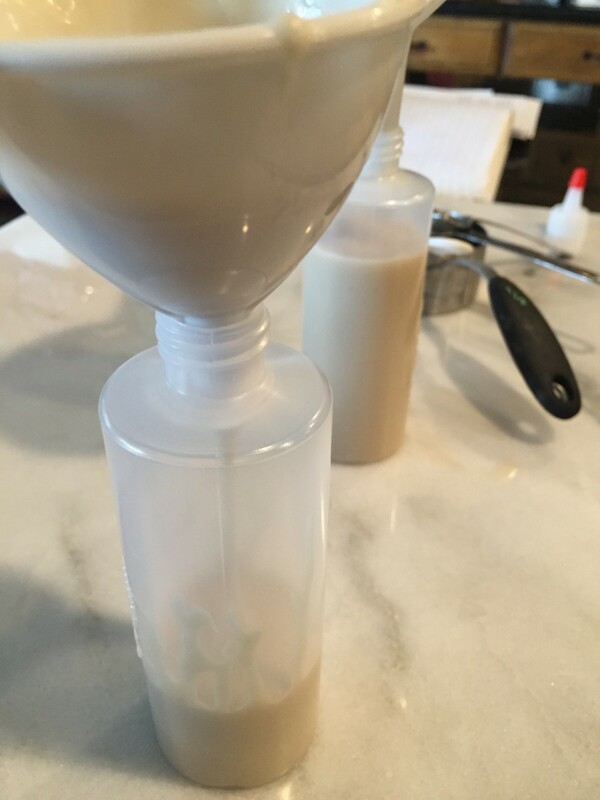 Twist off the cover of a clean squeeze bottle and insert the funnel into the opening, pour the flood icing into the bottle. It should pour easily, and quickly. Note: Do not sprinkle on the sugar immediately after you have flooded the interior with icing or the sugar will get absorbed, wait 10 minutes before doing so. Allow cookies to dry, uncovered for 24 hours. Depending on the thickness of your icing, it may take longer. When the cookies are completely dry it will appear smooth, dry, and resistant to smudges. Once dry, you can stack the cookies between sheets of parchment paper in an airtight container for up to 2 weeks. The leftover icing can keep for up to 4 days in the fridge. Let it come to room temperature before using again. You can divide your cookie baking and decorating over a couple of days by keeping half of your unbaked cut cookie shapes in the freezer, defrosting at room temperature for 60 minutes then bake and ice OR bake all the cookies on one day and do the icing the next day. To marbleize the icing, flood the entire interior with icing, add drop dots of food coloring then run a toothpick through the dots to “marbleize”. No need for blue dye, these are so festive without. Me want cookies!!! These are the prettiest Chanukah cookies and happen to be gf/cf/ef. Awesome. Your notes seem to be helpful and detailed. I would like to make these cookies for my daughter who has a dairy and egg allergy but have never made iced cookies before. Can I prepare the dough then freeze it for Christmas cookies? I don't have enough freezer space to put baking sheets of cut shapes in the freezer. Thanks Jessica. Lynn, you can certainly freeze the dough (in a freezer safe ziploc bag) then defrost and roll out for cutting. If possible, rather than a baking sheet lined with parchment (to prevent sticking), use something smaller to hold your cut cookies, even if it's just 1 dozen at a time, and freeze them for 10 minutes. It will really help hold the shape when baking. Better to do a little at a time and have perfect cookies I think. If you are just making round sugar cookies it doesn't matter. Sidenote: if the cookie dough is too warm before baking the "butter" will spread too quickly and alter the cut cookie shapes. Hope that helps! Enjoy! Aww, thank you for the kind words Stella. I want my own cookies too but around here I need to hide some for myself or someone is bound to eat them! These cookies are so pretty and festive and vegan! What a nice gift idea for the holidays. Glazed sugar cookies can be tricky to make, I had some flops due to uncomprehensive recipes and it makes gluten/dairy free baking frustrating sometimes thankfully your recipes always come out delicious and cannot wait to make these over the weekend. They look amazing Jessica! Oh. My. Goodness. Gorgeous. I have co-workers who have all different diets and this would suit them all. Now I need to get my rolling pin out and start phase 1: baking cookies! Beyond excited to see these cookies in my inbox! 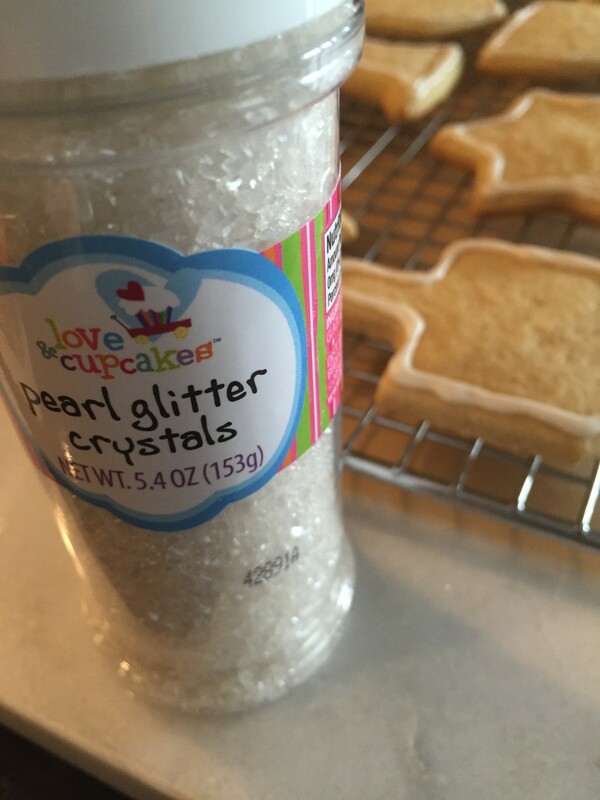 Have not found a good sugar cookie recipe yet and dying to try these. Happy Chanukah from our home to yours! These sugar cookies look so festive! Cannot wait to bake some for Christmas. Happy Chanukah Jessica to you and yours!! Happy Chanukah!! These are so pretty and look too good to be gluten free AND vegan. Now I'm tempted to get all laborous and clear my counters!! 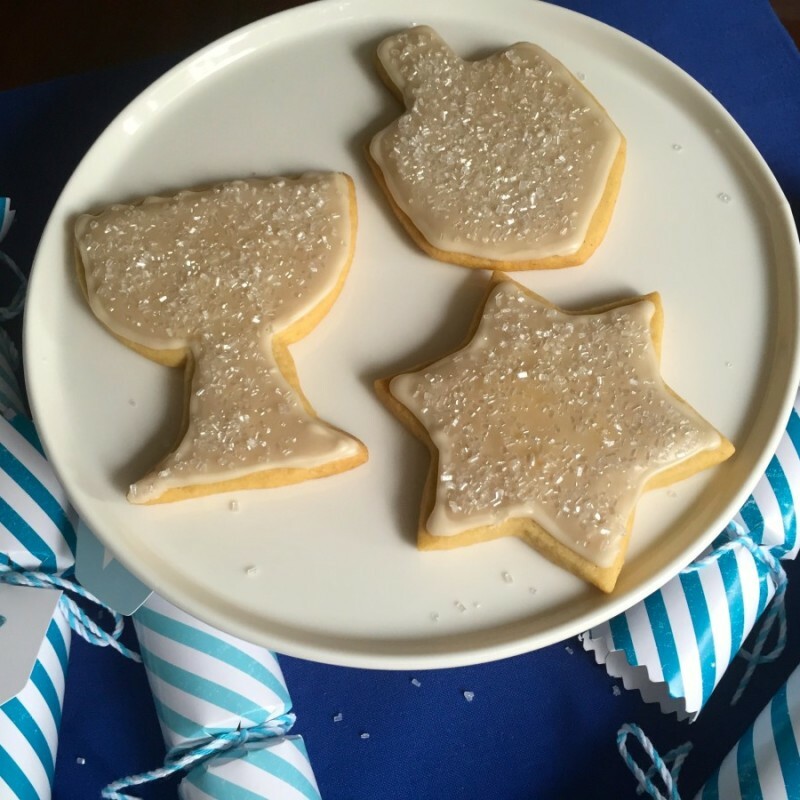 Thank you for the notes and how to work with gluten free dairy free sugar cookie dough. It's our first holiday season without the gluten and dairy baking but think your recipes will get me through. Also eyeing your other sweets! Welcome Jennifer to living gluten and dairy free. 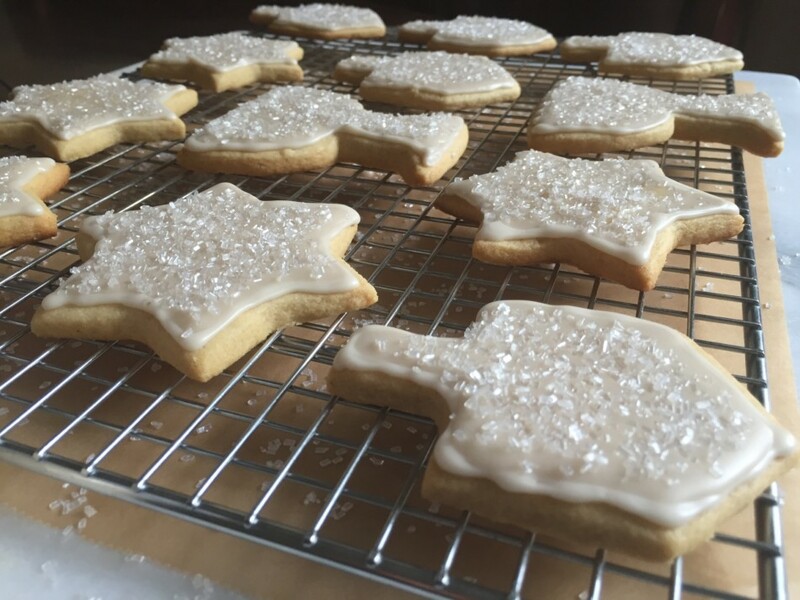 Hopefully all my notes will guide you along to make some yummy treats like these sugar cookies. Ask away if unsure about anything :) Enjoy! Good eye Tracy, they are! I bought them at Michael's craft store. I let my cookies sit at room temperature about 30 minutes before icing (border icing took a long time to pour) and they came out terrific. These are so festive, thank you for sharing the recipe. I haven't had a good sugar cookie in a long time since diagnosed with Celiac in 2010. I will definitely be stopping everything to make these tomorrow! Does the 1 to 1 flour have gums? We cannot have gums. Thanks. Beth, yes it does contain gums. I suggest using my flour blend for this recipe without the gum and add egg replacer for the equivalent of one egg, or if you consume eggs, one egg. Enjoy! Came across these lovely sugar cookies on Pinterest! I was wondering how much egg should I add to replace flax egg? Raquel, you can replace with one egg. Enjoy! Is the white rice flour sweet rice flour or just regular white rice flour? I assume the egg is in place of the flax and water? Have you tried making these in a mini muffin pan for "cup" style cookies? Thanks! Kathy, I use organic white rice flour from Bob's red Mill. Yes, 1 egg would replace my flax "egg". I haven't tried making these in mini muffin pans. I think they would bake fine, my only question would be is how to take them out without breaking them? unless they are in liners, then yes. I did make this recipe as a large cookie sheet cake (9 x 12 inch) and it came out softer than my sugar cookies, which was really nice. Hope that helps. Enjoy! Hi Jessica. I'm borrowing my sister's cookie cutters and they are about half the size, call them mini cookie cutters. Will that be fine? Any prerequisites I can't formulate? Your recipes, and detailed notes resulted in the best sugar cookies I have made. I think the freezing of the cut shapes before baking are genius. They are magnificent, with and without glaze. Thank you sharing this recipe, it is not my own! We are eating your cookies now after finishing the decorations on them yesterday (we made Hanukah themed cookies too) and I had to comment on how impressed we are with the extensive notes and recipe. It was easy to follow as if you were here and absolutely delicious! My sisters and I have decided these are the sugar cookies to bake from now on. Happy Hanukah!! You are so sweet Jillian, thank you. Happy Hanukah to you too!! My cookies came out amazing! 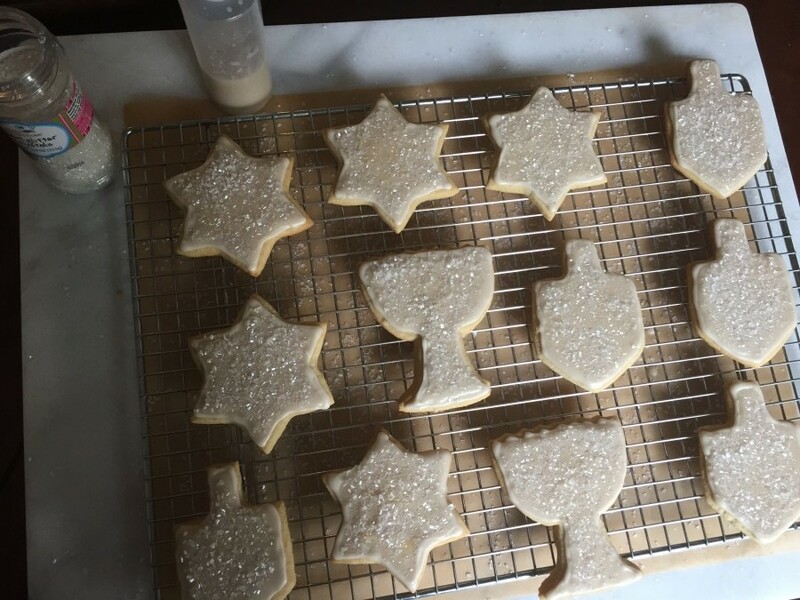 Thank you for all the photos, they really were helpful when making icing (my first time) and how cookies should look baked and the recipe of course. My nieces and nephews are going to love it!! I'm so happy they helped and they came out amazing - yay! Enjoy! !